(1) Added earrings, a new type of equipment item. 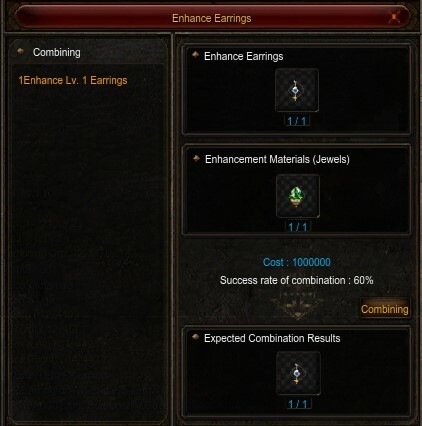 (2) Earrings can only be obtained from the Mastery Accessory Box Morse that are added to Morse NPC. (3) Earrings can be equipped by all classes. 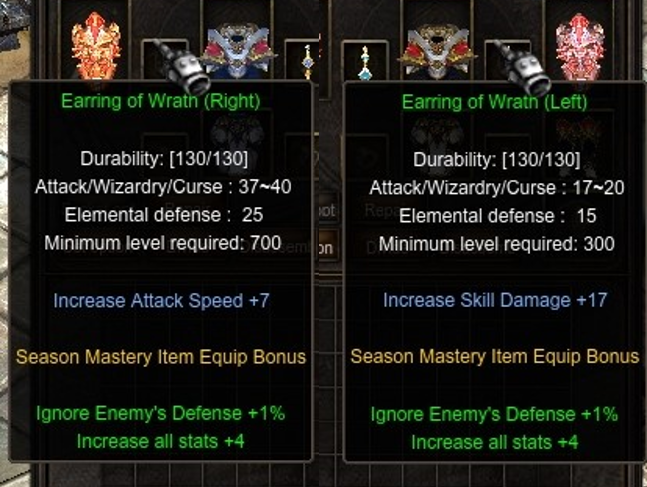 Earring of Wrath (Left) requires level 300 and Earring of Wrath (Right) requires level 700 and both have their own dedicated slots. (4) Earrings are updated every season. Players who wear the level 300 Earring (Left) and level 700 Earring (Right) of the same season receive the season set bonus. (5) Earrings can be enchanted up to +15 through the Enchant Earring menu from Chaos Goblin Combination NPC. (6) To enchant earrings, players need a new material item called Lapidary Stone. (1) Added Mastery Accessory Box Morse to the Moss NPC in Elbeland. 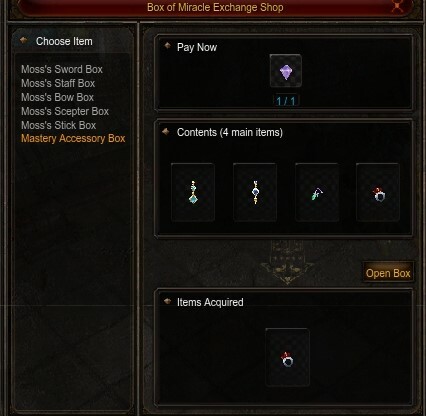 (2) Players can use the Open Box feature by spending 1 Jewel of Bless to have a chance of getting earrings. (3) According to the overall accessory overhaul, the Excellent Ring/Necklace, previously dropped on the fields (Elbeland, Lost Tower, Atrans, and Tarkan), can be obtained only from Moss now. (1) Earrings have basic options for Attack/MP/Curse and Element DEF. Enchantment increases these stats. (2) Earring of Wrath (Left Imprint) and Earring of Wrath (Right Imprint) have 1-3 random options from the option pool of 5. (3) Mastery accessories will be added each season. (1) Players can activate the enchant earring pop-up window from the Chaos Goblin Combination NPC in Noria. (2) To enchant a earring, players must spend a corresponding Lapidary Stone and some Zen. (3) Players do not lose the earring when an enchantment attempt fails. After +7 enchantment, a failed enchantment attempt resets the enchantment level to 0. (4) Enchanting earrings increases Attack/MP/Curse and Element DEF. (1) Added the feature to create Lapidary Stones to the Goblin Combination NPC in Noria. (3) Players can get a Lapidary Stone by combining each 10 jewel bundle (Jewel of Life, Jewel of Creation, Jewel of Soul, Jewel of Chaos, Jewel of Harmony, and Guardian Stone). Players cannot combine Lapidary Stones in a batch. (4) Lapidary Stones can only be used to enchant earrings.